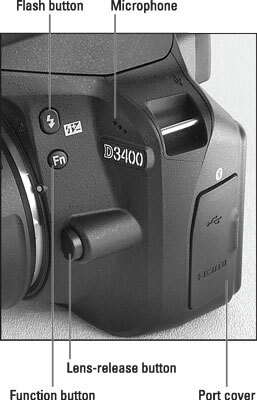 Flash button: In the advanced exposure modes (P, S, A, and M), pressing this button raises the built-in flash. In other modes, the camera controls whether flash is enabled. By holding the Flash button down and rotating the Command dial, you can adjust the Flash mode (Fill Flash, Red-Eye Reduction, and so on). In advanced exposure modes, you also can adjust the flash power by pressing the button while simultaneously pressing the Exposure Compensation button and rotating the Command dial. The little plus/minus symbol that appears below the Flash button — the same symbol that’s on the Exposure Compensation button — is a reminder of the button’s role in flash-power adjustment. Function (Fn) button: By default, this button gives you quick access to the ISO setting, which controls the camera’s sensitivity to light. If you don’t adjust that setting often, you can use the button to perform other operations. Note that you can’t control ISO in the Auto and Auto Flash Off exposure modes or Night Vision Effects mode, so pressing the Fn button has no result in those modes. Microphone: The three little holes just above the silver D3400 label lead to the camera’s internal microphone. Lens-release button: Press this button to disengage the lens from the camera’s lens mount so that you can remove the lens. Don’t confuse this lock button with the one on the kit lens (and other retractable lenses) — you press the button on the lens to unlock it so that you can extend or retract the lens barrel. Connection port door: Open this little door to expose the camera’s USB and HDMI connection ports. Press the Flash button to use the built-in flash in P, S, A, or M mode.